In the "Goings On About Town" section of this week's issue, I'm responsible for the concisely worded snippets about NOFX, The Subways, The Strokes, Satanicide and the Dropkick Murphys. If you'd care to read'em, feel free to click here. I know I suggested that regular service might be suspended here for a while, but I'm back home at the moment, it's quiet and for the first time in about twenty hours I have sweet f.a. else to do, so I thought I'd expound on my previous post, which was admittedly on the cryptic side. As alluded, we had a bit of a hiccup of sorts and needed to check the wife into the hospital. A bit of a scare, but all is under control (thank you, well-wishers!). I shan't be passing out cigars just yet, but that moment is looming sooner than previously expected. In any event, don't touch that dial. As such, over the past three long, nervous days, I've been breathlessly jogging back and forth between home and hospital, trading Charlotte-minding shifts with my Mom and then racing back to my wife's bedside to be briefed on latest developments. The hospital in question is mercifully only a neighborhood away, but the trek to and from never seems to feel any shorter. Anyway, late on Friday night, as I was heading home to relieve my mother of her baby-sitting duties for the evening, speed-walking testily down W.12th street, I see a sharp dressed couple walking directly towards me. I was all prepared to go all Richard "Verve" Ashcroft circa "Bittersweet Symphony" on them and bisect their sidewalk-hording couple's nuzzle until I recognized them. A striking blonde woman on the arm of a slightly pudgy gent who looked disarmingly familiar -- turns out it was Diane Krall and ELVIS COSTELLO, presumably on their way out for a late supper. Not wanting to offend rock royalty (well, Elvis, anyway), I sidestepped them as they brushed past me (the snippet of conversation was sadly indecipherable in the windy cold, but it was unmistakably his voice). Under normal circumstances, I'd have obnoxiously broken out into an entirely unsolicited a capella rendition of "I Can't Stand Up for Falling Down" or "Goon Squad," but I had things to do and wasn't in the mood. But it was nice to be plucked momentarily out of my stress-pool for a fleeting coolster celeb-spotting. Thank you, New York City! If we end up having a boy named Elvis, you'll know why. Certain familial developments not scheduled nor expected for another several weeks decided to "get a jump on things" yesterday afternoon, although full fruition was mercifully not accomplished. As one would expect, these proceedings have left all parties concerned somewhat shaken. 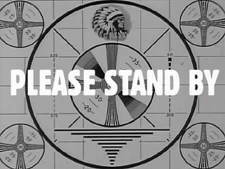 All is well, however, and representatives of modern medicine have informed us that this is but a "minor setback." That said, the afore-mentioned schedule is now being somewhat frantically re-addressed. We're thinking that damn stork might make another strafing run at any moment. As such, regular service here at Flaming Pablum might be suspended for a while. In this week's issue of The New Yorker, my editors let me tersely blather about Meat Beat Manifesto, Rakim, Silverstein and Canadian indie-pop ensemble, Stars. You can find them in the "Goings On About Town" listings, or you can simply click right here. I'm a sucker for photographs of New York City, especially ones that deviate from the norm. 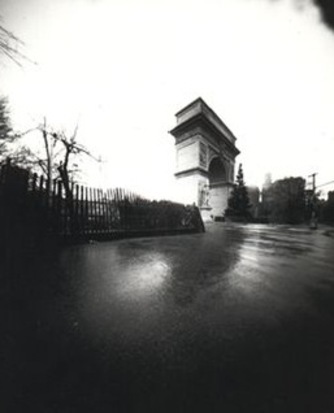 There's a pharmacy in my neighborhood that often features work from local artists and photographers, and this latest installation features the work of one Veronica Saddler, who takes striking photographs of NYC landmarks with a "pinhole camera". I think it's outstanding stuff, so please check out her website by clicking right here. It was incredibly cold here in New York City this past weekend. Adding insult to injury was the fact that our daughter, Charlotte (as previously noted) has been battlling an ear infection, making her wholly irritable and disagreeably vocal. As such, I seized every opportunity to escape the apartment, even if it meant trudging out into the unrelenting winter chill. While combing the streets looking for an open barber shop on Sunday morning (no easy feat), I called up on album on my long-suffering iPod that always seems to fit the frozen mid-winter bill, that being the criminally maligned 1984: For the Love of Big Brother by Eurythmics, as its chilly blend of mournful instrumentals and fittingly frigid synths perfectly compliment the merciless cold of the NYC winter. Why has history seemingly erased this album? Nary a track from it appears on any Eurythmics' best-of (neither Greatest Hits from 1991, nor 2005's misleadingly titled Ultimate Collection, much less on Boxed, their...er..boxed set) , and - to my knowledge - it has never seen a proper Stateside release on compact disc (relegated to a scarcity in import bins). 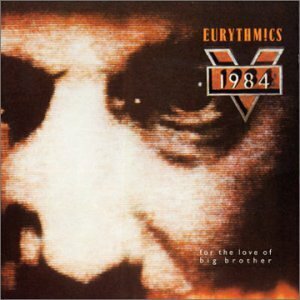 If I'm not mistaken, there was some big falling out between the Eurythmics and the film's director, Michael Radford, resulting in the band's music either being stricken from the film or reduced to a less prominent placement therein. 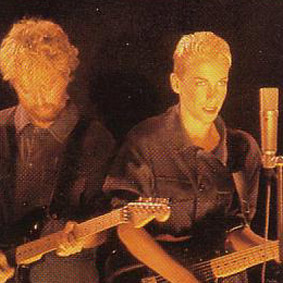 The band seems to have disowned it, AMG (All Music Guide) is needlessly cruel to it ("the album is substandard if judged as an independent Eurythmics album, adequate if judged as a soundtrack") and no one seems to cry out for its proper re-release. Bastards! Regardless, I still think it's some of the most interesting music the Eurythmics ever released, from ambient instrumentals to pounding dance tracks, each imbued with an icy sense of futuristic paranoia and despair. Following this record, the band jettisoned virtually all semblance of restraint and subtlety from their mix and basically became preening chart whores, pooping out gloopily glossy pop product like "Sisters are Doin' It For Themselves" (alright, I'll admit -- that's a bit harsh, but as far as I'm concerned they crossed a Rubicon when they abandoned this record -- though I do still love "Missionary Man" from `86). Regardless, whenever I'm reaching into the shelves for a Eurythmics disc, this is the one I'm picking out. I cannot be alone in my appreciation for it, though. There must be others out there. As fate would have it, it's also one of my wife's faves as well. We both swoon to the elegant lament that is "Julia" and giggle at the goose-stepping ludicrousness of "Doupleplusgood". And if you can't recognize the gloomily groovy austerity of the album's single, "Sexcrime (1984)" -- a top ten hit in their native England -- then screw it, you're dead to me. It is freakin' cold out, and I'm not at all happy about it. I had to pop out this evening to do both some last minute grocery shopping and -- as a bonus -- escape the ear-wrenching caterwaul of my little two-year old daughter Charlotte, as she noisily voiced her grievances with bathtime (to be fair, as I mentioned earlier, she's currently grappling with an ear infection, so isn't her usual cheery little self). In any case, my errands found me heading down West 8th Street, one of the more travelled byways of the Village. From about 1979 through 1989, I probably considerd West 8th Street between Fifth and Sixth Avenues to be one of the most important strips of real estate in Manhattan, as it played host to shops like Venus Records, kickass poster outlet Psychedelic Solution and a great rock memorabilia emporium (albeit slightly biased towards all things Heavy Metal) dubbed It's Only Rock'n'Roll among many others. As a snot-nosed Upper East Side brat in a Catholic school blue blazer, I'd take the subway downtown after school on Fridays with my friend Rob B. to wander up and down West 8th (and its immeasurably cooler counterpart to the East, St.Mark's Place) buying Misfits LPs at Revolver Records or Anthrax badges as Postermat and basically thinking, "damn, I live in the greatest city in the world!" (the fact that the `Stones namechecked the street -- which also plays host to Hendrix's Electric Lady Studios -- in "Dance Pt.1" on Emotional Rescue only vindicated my fascination for it). Well, as I've lamented elsewhere on this weblog, the passage of time is a strange thing. The allure of West 8th street eroded pretty quickly, and soon became a touristy strip to avoid. The shops I once held dear like Venus, Postermat and It's Only Rock'n'Roll either moved or closed. Never did I imagine in my early days as an 8th St. frequenter that I would one day live on it (the rear side of my building abutts the street in question), but now I do, and while I can't help but think back to my younger days when walking down it, I usually do so as infrequently as possible. But there I was on a frigid Saturday night, walking West on 8th and what's this? Apparently, the timeless rock t-shirt store, Butterflys, has finally lost its lease. The establishment where I probably purchased my first Iron Maiden t-shirt (much to my mother's pronounced chagrin), the loss of this particular boutique will mean little or nothing to practically every conceivable reader of this weblog, but to an infantesimal smattering of locals, it might strike a chord. I probably hadn't spent a thin, red dime in the place in over twenty years (actually, that's not true -- I bought my nephew a Zeppelin t-shirt there two Christmas's ago), but that didn't mean I ever wanted it to leave. But it's gone now, and a tiny part of my adolescence is forever gone with it. Further enabling this particular syndrome is the reliable crop of retro-wannabe artists who surface every few years. Nothing fuels the fire of insufferable oneupsmanship in greying music geeks more than bands like, say, Interpol or Rancid who clearly and unmistakably model themselves and their respective aesthetics on forebearers from a decade or two earlier. This gives we oldsters the opportunity to cite the bands being "ripped off" and gives us a chance to once again lord over our youngers the arguable truth that try though they may, Interpol will NEVER match the intensity of Joy Division and that Rancid will simply NEVER MATTER in the same way the Clash continue to do. These statements are often delivered with a barbed and brazen patina of comtemptuous territoriality. So suddenly last week, I'm sitting at my desk at the Job, and out of nowhere comes a blast of gloriously stentorian, metallic monochromania that swings like a concrete pendulum of head-denting DOOM. 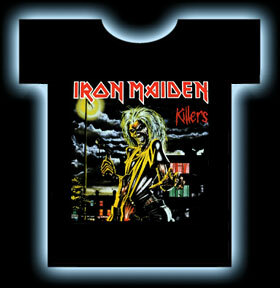 I look around and it's coming out of venerable rock journalist Kurt Loder's office of all places. It uncannily bears the sonic hallmarks of classic Black Sabbath. 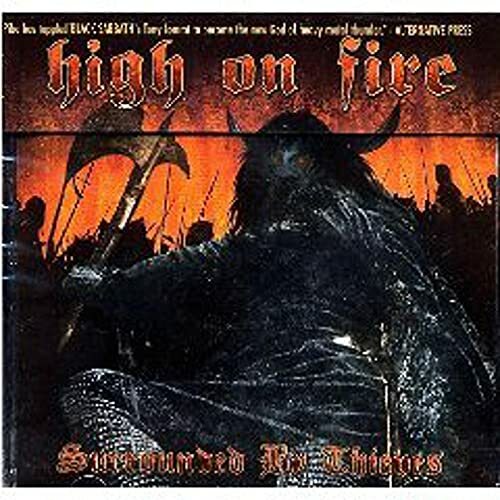 Lots -- if not all -- Heavy Metal bands have aspired to the Sabs' patented strain of weighty proto-metal riff-mongering, but few have come close to credibly replicating it. But this....this sounded amazing! I'd later learn from my colleague, savvy metal writer and excitable n'erdowell, Chris Harris, that the album in question was Age of Winters by a Texan combo dubbed The Sword. Practicing a thick, impenetrably heavy yet still strikingly melodic brand of ultra-weighty guitar rock in seemingly its rawest form, the Sword eschews the stealthy shenanigans of latter-day thrash and speed-metal in favor of an oft-ponderous groove that manfully strides like a marble titan instead of franticallly sprinting like a horny hyaena. Mercilessly brutal, yet executed with a sinister elegance, the Sword sound disquietingly similar to the dark majesty of Black Sabbath's first three albums, but that's a feat that has been so difficult to adequately master that they absolutely cannot be faulted for it. They do it so brilliantly that any cries of stylistic plagiarism are entirely moot. Age of Winters boasts the sound and aesthetic Dave Grohl was probably trying to achieve with Probot in 2004, yet manages to do without sounding contrived or self-conscious. Unlike Probot, this band plays as if the era of classic metal never ended and as if they'd never even heard of Hip Hop or Nu-Metal or anything recorded after, say, 1983. The Sword's music punctures silence like a bowling boll lobbed through a stained-glass window. 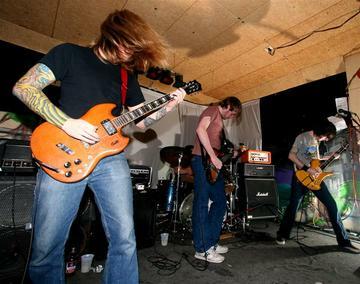 As they declare on their own MySpace page, they sound like of "a bunch of bison being pushed off a cliff" (c'mon -- are these guys freakin' awesome or what?). I mean, really, what's not to love? Couple this endearingly ludicrous fixation with axe-wielding medieval tomfoolery (less Tolkien, more Moorcock and Lovecraft) with their strikingly faithful approximation of vintage Sabbath, and you have a recipe for metal perfection. 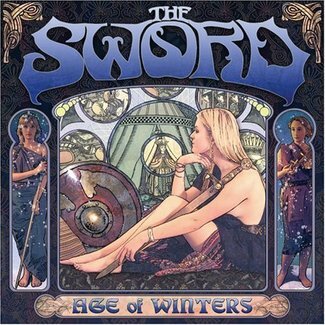 If I have any complaint with Age of Winters, it's probably only with the cover art, depicting a deceptively placcid Arthurian tableaux better suited to collection of harpzichord concertos than implausibly hefty, doomy metal. In this regard, I'd suggest they take a lesson from their similarly-inclined peers in stoner metal ensemble, High on Fire, who endearingly choose to disregard all semblance of subtlety. If anything, the sleeve art of Age of Winters (designed by fellow Texan, Conrad Keely, drummer of the equally volatile-yet-not-at-all metallic combo, And You Will Know Us By the Trail of Dead) looks like it was pulled right from the card game, Magic: the Gathering, which is too geeked out even for the likes of me. 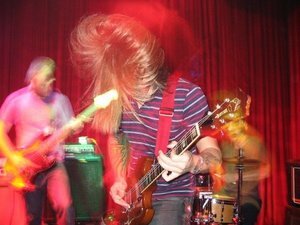 In any event, I suppose the fact that this youthful gaggle of beardy indie goobs can make music that sounds as genuinely behemothesque as Paranoid by Black Sabbath (inarguably the blueprint for all that dares to allign itself with Heavy Metal) proves that there is still hope for the younger generation after all. Hello, loyal readers, accidental newcomers and abject time-wasters. Sorry for yet another delay in regular service here. It's been a busy week, and little Charlotte (almost two yrs old) has had a fever and another ear infection, so it's been kinda crazed, screamy and sleepless at Chez Pablum. Look for new missives coming later today, but please sit tight until then. Actually, in the interim, why not check out crazed cartoonist, John Kricfalusi's weblog (he of "Ren & Stimpy" fame)? Or go marvel at the idiocy of Hot Johnny?